YOU MUST SEE this Remarkable Home! 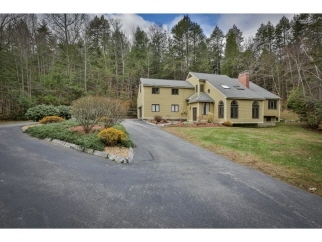 Stunning Contemporary Colonial home in desirable Amherst area. 4 bedrooms, 4 baths, beautiful dream chef's kitchen, granite counters, spacious center island, double ovens, cherry cabinets plus a walk-in pantry. Large deck for outside entertaining. Fabulous 1st floor master suite with NEW CUSTOM SPA bath, 2 walk-in closets. 1st floor laundry. This home has beautiful hardwood floors and tile throughout. 3 large bedrooms upstairs plus 2 full baths. Sun drenched great room with cathedral ceilings plus fireplace/new pellet stove. Family room with wood fireplace. Large dining room with beautiful crown molding. Home gym in lower level. Plenty of storage. Multiple home improvements including NEW WHOLE HOUSE GENERATOR. 2-car garage with convenient circular driveway. Security system, lovely side yard, perfect play area for children. Property abuts conservation land. Family friendly neighborhood. And only 1 hour to Boston.